toying with a beholder’s emotions. what could go wrong? Okay. Why is Bob forgetting his central eye and it’s power? Seriously. It’s one of a beholder’s greatest offenses, as well as defenses. Orrrrrrr . . . how about you just vaporize her, and figure it out later? For the same reason you don’t shoot the only person who knows the code. Doesn’t his central eye negate magic? …yeah, this does not seem like a trap that should have gone off even once given Bob was looking right at her. WTF? 1) It’s a touch trap. 3) Look right at her? If you’re referring to the Gorgon I’m sure Beholder’s are immune. He means Bob’s central eye which is CONSTANTLY radiating an anti-magic field would have dispels the barrier and the lightning trap, even if it was invisible. ah, I see… yay pun! Hmmmm…something is off here. I am not sure what. 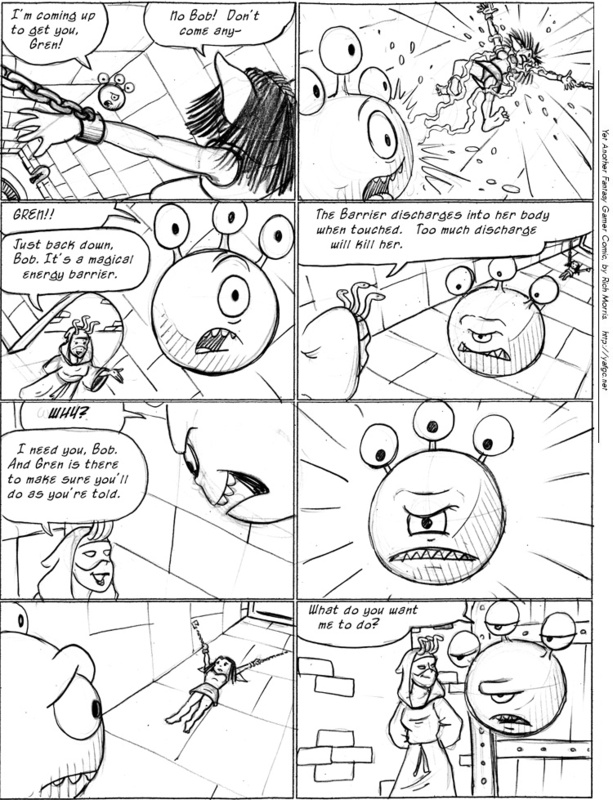 I don’t think the Beholders have been shown to have anti magic abilities in this comic. Bob’s been shown to be outright immune to some magical effects (like the gorgon gaze) but no cone of anti magic. Still I would assume the disintegration eye ray could be useful here, but Bob could be worried about his accuracy and he doesn’t have hands to catch a falling Gren. Beholders have a telekinesis eye which can easily support Gren’s weight. That what I was thinking as well. I think Rick even mentioned it somewhere, that the beings in his comic though originally based on roleplaying games, are do not necessary 100% like the ones in them. It well could be that beholders in the yafgc world don’t have the anti magic ability. As for the rest, I think Bob is just way too… what would be the best word? agitated?, upset? furious?… anyway, I think he is just not in a state to think calmly and clearly. Good thing he brought Grell along, now he should just start to listen to him as well. Was wondering about that. "Magical field, well… oh look it doesn’t work… funny that." But yeah, no anti-magic from the central eye would be a problem here. He should have an anti-magic field to disable the traps, disintegration for the chains, telekinesis to lift Gren, petrification to rub in the Gorgon’s face… but this beholder seems disadvantaged. See this is Bob needing to find out what the snake with legs needs. Then he gets to vaporize her. "Just hang in there, Gren." Being suspended by her arms this way will kill her anyway. It’s basically the same thing as crucifixion. Maybe Bob isn’t a full beholder? maybe he’s a beholderkin, like a Gazer. It would explain why the Beholders in the mountain weren’t paranoid sociopath constantly worried the other races were out to get them like most Eye Tyrants. True, the beholders of Black Mountain could have been a species of Spectator, rather than the Xenophobic Eye Tyrants that beholders are usually seen as. It also might be that he’s a fairly *young* Beholder. Central eye might negate magic, but not be powerful enough to chance against a full-power Rannite spell. Because if he guesses wrong, Gren ends up medium rare. Still, that Rannite gorgon is really playing the Bullying a Dragon trope to its outer extreme. Bob may be young and underpowered, but he can absolutely ruin your s**t when he gets angry enough. Yeah, I was thinking about his antimagic cone too, but then I can’t recall when Bob has ever used his central anti-magic eye before, which suggests he doesn’t have one. Consider that if he had an anti-magic cone, he could have used it back during the Lewie’s Rings arc to shortcircuit that whole saga; turn off the ring with antimagic, tell people what’s going on, and they’ll take the rings off. Also, he (and every other beholder I can recall seeing) has three eyestalks, not ten, which makes them clearly different from standard D&D beholders. Why does Meegs lead Bob into a trap instead of beating him with magic (which at the time was a perfectly reasonable question)? Why does Bob not kill the Gorgon? How does she know he won’t? Why does the Evil Plan work (for now)? How do they know it will? Because one of the several reasons this comic is great is that it is about CHARACTERS. 1. So the gorgon lady can blackmail the beholder, if the Rannites can’t just torture him, and it proves Bob can’t just save Gren. b. She sees him fail, and although he hates her, it won’t help Gren. She thinks he’s reluctant but contained. 3. a. The Evil Plan has worked so far. Captives turn Rannite. How long can Gren last, chained up and magically shocked, her hope of rescue thwarted? b. Really they don’t know, but nobody (not even Ch’Thier) has stopped Ranna yet. It may be hubris, but all the evidence points to the Plan working.